The Piazza del Duomo is a wide, walled area in the heart of the city of Pisa. It is partly paved with grassy areas and contains four very important religious edifices, one of which, the Duomo, contains the ceiling pictured above. The Duomo houses several important medieval art works and a magnificent marble pulpit as well as the 16th century gilded, coffered ceiling. The ceiling is carved in wood and was replaced after the fire of 1595, which destroyed part of the Duomo and many of the medieval artworks it contained. The ceiling is one of the most visually startling aspects of the Duomo; its gilded entirety creates considerable light that is then reflected onto the surrounding floor and walls. Against the black and white marble of the Duomo's interior, the ceiling immediately draws the eye upwards. The coffers are interspersed with three different designs. There are roses and acanthus leaves, a cherub's face on a background of interlocking wings and a medieval Italian coat of arms depicting a lion holding a rose. In the centre of the ceiling is the Medici coat of arms, which is considerably larger than the individual coffers. The ceiling, which is decorated with 24-carat gold, is a legacy from the city's period of Medici rule; it oozes with the opulence associated with religious devotion of the time. 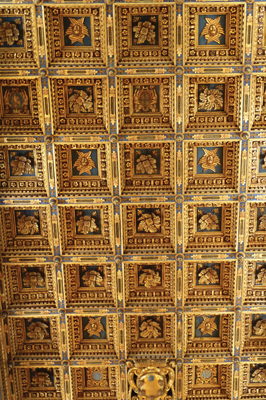 Gilded, coffered ceilings have been important symbols in Italy since Etruscan times; they were reserved for only the most prestigious of public buildings. The ceiling of the Piazza del Duomo evokes a venerable tradition of royal and divine allusion that has been practiced since Roman times. The ceiling mirrors the heavens and the gods within it; by gilding it, the gods are glorified.